Over the years I’ve had the opportunity to work with lots of wonderful food related products; things I otherwise would not have tried. Most recently I was given a chance to review two different cuts of Silere Alpine Merino Lamb. The kind folks at Marx Foods, who I’ve worked with several times in the past, sent me some Merino loin filets & French racks to try. Merino, a New Zealand breed of lamb are slow growers which makes them naturally leaner. The Silere Alpine Merino are not only free range but also open range, with a diet that consists of alpine herbs and natives tussock grasses. Because of all this the Silere Alpine Merino are highly desirable for their meat. This past Saturday night hubby and I set out to do some Silere Alpine Merino sampling. We decided to work with the racks first, as I thought these petite chops would make an excellent appetizer. Though they did arrive trimmed and ready to be cooked, we further cleaned and tied them following the instructions in this video. We seasoned the lamb lightly with salt and pepper and grilled it sauce/rub free, over medium high heat until it reached an internal temperature of 125F. After letting it rest we dug in. The texture of the meat was silky, almost buttery and the taste was very fresh and mild. They were eat of the bone tender and though I served it with an herbed pesto it did not need any sauce. We used the same cooking method to cook the loin filet but removed it when the internal temperature reached 110F. This cut of meat was also perfectly delicious sauce/spice free. It did however pair nicely with the herb and olive tapenade and some Meyer Lemon & Sweet Pea Orzo Risotto I served. Compared to conventional lamb the Silere Alpine Merino is very mild tasting, lean and delicious. In my opinion it does not have the bold gaminess you often find with other lamb. And it is definitely a meat that even the most discerning lamb eater would enjoy. I would say it is the "Cadillac"of lamb. Grill rack over medium high heat until internal temperature reaches 125F. Allow to rest before serving. Mix all of the fresh herbs, garlic, capers & olive oil in a food processor until you have a thick paste. Season with salt and crushed red pepper. Grill lamb over medium heat until internal temperature reaches 110F. Allow to rest before cutting and serving. In a small bowl, whisk together the vinegar, honey, olives, garlic, cumin, mint and olive oil. Serve alongside lamb. Heat oil in pan. Add garlic cook, stirring, until soft, 3 minutes. Add orzo, zest, thyme, salt, and pepper; cook 2 minutes. Add water/stock ¼ cup at a time, cooking until each addition is absorbed before adding the next. Cook, stirring often, until orzo is tender, about 30 minutes. Add cream and peas and cook, stirring, until liquid is creamy, about 3 minutes more. Remove from heat and stir in lemon juice, Parmesan, salt, and pepper; serve with additional Parmesan on the side. This sounds like the ultimate free-range, grass-fed meat! I hadn't heard of this type of lamb before either, but I can never resist cooking lamb in various ways. It has such wonderful flavor! I haven't heard of this type of lamb before either, but it looks amazing! It's always ab out what the animal eats that makes them so tasty! Sounds great, my husband would love this! 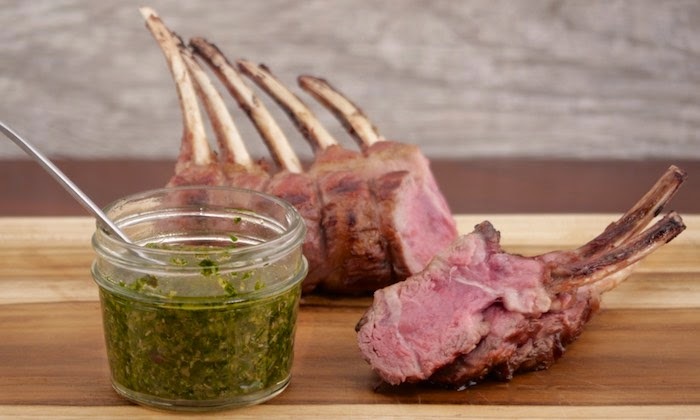 Rack of lamb is one of my favorite meat choices. Sounds amazing - I haven't heard of this brand of lamb before, but I will certainly look for it! Lamb can be somewhat fatty so I especially love that it's more naturally lean! This looks and sounds amazing. Rack of lamb is my favorite meat by far. I had never heard of it before, either - but holy cow, it sounds fantastic! And you cooked it just perfect...I wish I could reach in and grab some. I love lamb. It's probably my favorite protein. Was there supposed to be a video link in the post? I was looking forward to seeing how to clean and tied the rack. I LOVE lamb! We don't make big cuts of it often since it's just my husband and I but I would totally dig into this deliciousness. Yum!